Coltrana Springtime Lassie, born 23rd May 2004. Owned and adored by Dave and Becky Trueman. Shelby is now retired from working: at nearly 12 she is an old lady. She was rehomed at nearly 5 years old as a demanding young lady, and settled down into the demanding old lady she is now! You could not meet a Newfy that more typifies the breed: she is sweet, gentle, strong, powerful, stubborn, and very slobbery! Shelby took to the draught work very well, and a few days before her 8th birthday (the limit at which a Newfy can’t enter a Level 4), she passed her Level 4 draught! She also achieved the multi-passes at all the other draught Levels, and did lots of christmas tree pulling and sleigh rides for children at Christmas. Nothing phases or scares Shelby at all (except for wasps), and so she made a wonderful draught dog. 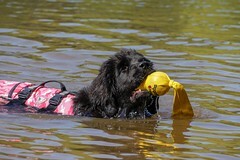 Shelby needed much more work in the water, as although she always loves a paddle, she did not really understand how to swim and she would not retrieve anything on land or in water. 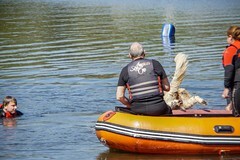 After lots of training, she started to enjoy the water, and even achieved her multi-pass B, which for a dog who didn’t retrieve anything is a great achievement! Shelby loves nothing more than to eat, sleep and receive lots of love and strokes. She also loves small dogs and meeting one still gets her tail wagging in her old age. Her name in her previous life was ‘Shebah’, which was felt to be a bit too feline, hence her name Shelby, although she does also answer to ‘biscuit’! Rother Valley Training Group Blog at WordPress.com.